On 14 and 15 November, there was held the national exam on teachers’ knowledge, abilities, and competencies that forms part of the performance evaluation. According to the Teachers’ Professional Docent, 40,303 teachers participated in 25 states of Mexican, comprising almost 97.8% of all teachers. Following this first performance evaluation, protests raged in at least 10 states, and the Minister for Public Education (SEP), Aurelio Nuño Mayer, decided to dismiss the state delegates from Durango, Tlaxcala, Sonora, Zacatecas, and Morelos, after carrying out the first assessment of the evaluation. In Chiapas, teachers affiliated with the National Coordination of Educational Workers (CNTE) mobilized from 13-15 November in marches wherein more than 30,000 teachers participated. 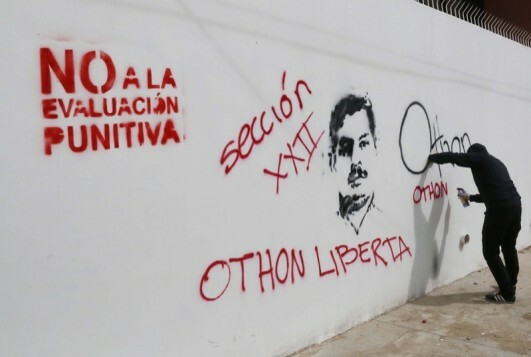 The CNTE teachers indicated that their demands are very clear: “suspension of the educational reform, rejection of punitive evaluations, and liberation for our political prisoners.” With this last comment, they made reference to the 4 Oaxacan teachers who were arrested and transferred to the Federal Center for Social Readaptation in Altiplano, Mexico State, in October. Amidst these protests, the evaluations were pushed back until December in Chiapas. In Michoacán, 5,000 police arrived to the capital Morelia to guarantee that the exam take place on 21-22 November. It was reported that the federal agents came prepared with anti-riot equipment, shields, and helmets, beyond their weapons. In Oaxaca, Governor Gabino Cué Monteagudo sent his general secretary of governance, Alfonso Gómez Sandoval Hernández, to present the V Report of the State Government to the congress. The absence of the governor had to with the fact that Section 22 of the National Union of Educational Workers (SNTE-CNTE) planned to mobilize at the site where the report was to be presented. As such, it was surrounded by nearly 2,000 state and federal police. In other news, Section 22 of the SNTE-CNTE made public the agreements it had made at the Broad National Representative Assembly (ANRA) on 18 November in Mexico City. Representatives declared that on 26 November, in observance of a global day of action for Ayotzinapa and Mexico, the teachers participated in a march in the city, at the end of which they installed an indefinite sit-in for the relatives of the 43 student-teachers from Ayotzinapa, Guerrero, to pressure the government to implement the recommendations made by the Inter-American Court on Human Rights (IACHR). Beyond this, on 14 and 15 November they plan to march in the national caravan to Altiplano to demand the release of the politically imprisoned teachers. Lastly, they called on the secretary of public education, Aurelio Nuño, to hold a public debate with the CNTE. 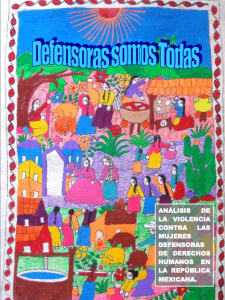 In mid-December, the Independent Commission for Human Rights in Morelos (CIDH-Morelos) and the National Network of Female Human-Rights Defenders in Mexico (RNDDHM), as well as other organizations, presented the report “We Are All Female Defenders,” which proffers a national diagnostic regarding the work organizations and positions they have held and questions documented by women who defend and promote human rights when they have been attacked, in their majority by State officials. The diagnostic indicates that, from 2001 to date, 34 female rights-defenders have been murdered; it highlights eight cases in Guerrero, seven in Chihuahua, and five in Mexico City. In this way, the document specifies that the most violent states for female human-rights defenders to carry out their work to be Oaxaca, Guerrero, Chihuahua, Veracruz, and Mexico City. The female defenders also warn of the increase in attacks on female activists and journalists as regards the manifestations which have demanded the presentation with life of the 43 students from Ayotzinapa, who have been disappeared since September. 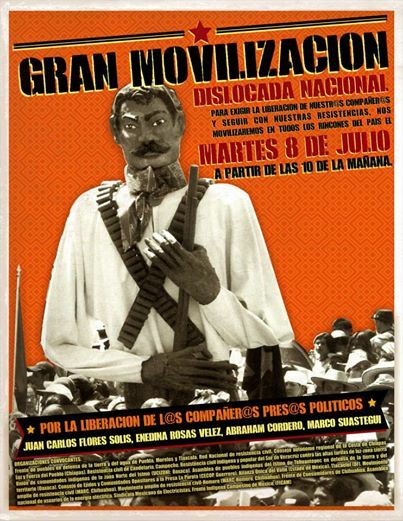 On 8 July, members of 38 social organizations organized a “Disjointed National Mobilization” involving roadblocks and protests in Mexico City, Yucatán, Chiapas, Veracruz, Puebla, Oaxaca, Morelos, and Chihuahua. 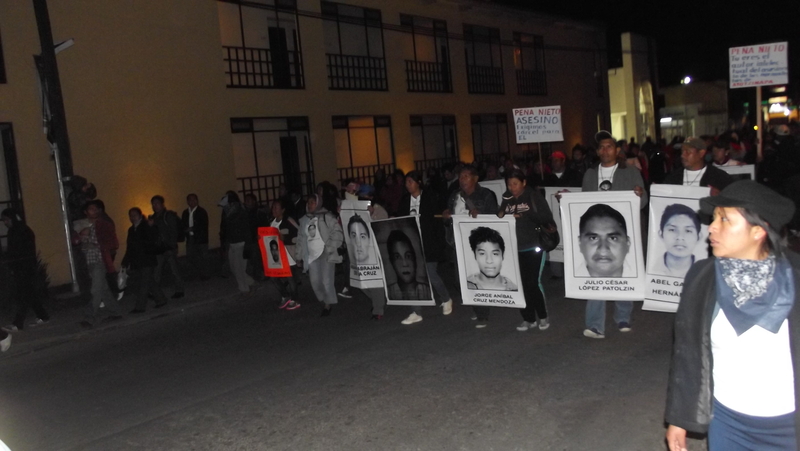 The mobilization was organized to demand the release of Juan Carlos Flores Solís, Enedina Rosas Vélez, and Abraham Cordero Calderón, who have been imprisoned in Puebla state since April of this year for their opposition to the Comprehensive Morelos Project (PIM). PIM, which is overseen by the Federal Electricity Commission, seeks to build two geothermal plants as well as an aqueduct and a gas pipeline to supply these plants; the additional infrastructure would cross the states of Morelos, Puebla, and Tlaxcala. The construction works are being conceded to transnational firms, both Spanish and Italian. 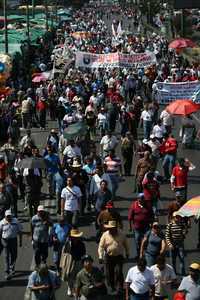 On 11 September, dissident teachers from several Mexican states (Aguascalientes, Baja California, Chiapas, Durango, Guerrero, Jalisco, Michoacán, Morelos, Nayarit, Oaxaca, Querétaro, Tamaulipas, Tlaxcala, Yucatán, and Veracruz) joined the protests organized by the National Coordination of Educational Workers (CNTE), which marched starting at 10am in Mexico City toward Los Pinos. The Secretary for Public Education that day distributed the decrees which are to reform the General Law on Education demanding the expeditious institution of the laws recommended by the National Institute for the Evaluation of Education and the General Union of Professional Teaching Services, which entered in law on 12 September. In Guerrero, some 5000 teachers from the State Coordination of State Educational Workers (CETEG) marched on the Sol Highway to protest the educational reform and its secondary laws. In the protest participated teachers from the central and mountainous regions of Guerrero, principally, who went on strike in response to the call for mobilization on the part of the CNTE. In Oaxaca, the Unions of Workers from the “Benito Juárez” Autonomous University of Oaxaca (STEUABJO) and of Educational Workers from the Oaxaca State Conalep (SUTDCEO) held a 12-hour strike to observe the national general strike called for by the CNTE. Similarly, the Unified Front for Struggle (FUL) and the Popular Assembly of the Peoples of Oaxaca (APPO), teaching students, and retired teachers participated in marches, occupations of buses, and blockades of the TV Azteca office, preventing the exit of dozens of workers. In Tuxtla Gutiérrez, Chiapas, approximately 1,500 teachers from Sections 7 and 40 marched, closing the four access-routes to the capital during the entirety of the day. 15 days after having begun the mobilizations and protest actions against educational reform, the teachers on that day added to their demand a rejection of the fiscal and energy reforms, in parallel terms to social organizations and campesinos. By means of social networks and text messages, on 10 September there began a calumnious campaign in the media opposed to the teachers’ movement in Chiapas. On 7 February there were carried out protests and blockades in the capital and in several states of Mexico to protest high-electricity prices. 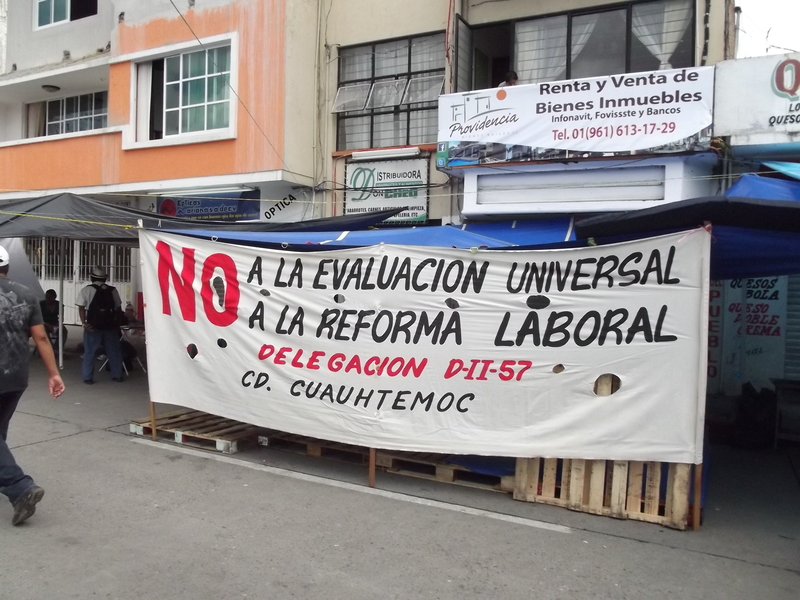 The mobilization had been organized by the National Network of Civil Resistance against High-Electricity Prices, the National Alliance of Electricity Users (ANUEE), and the Mexican Union of Electricians (SME). 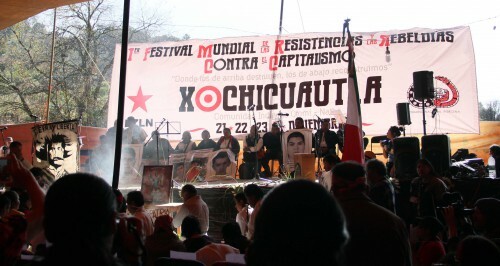 The marches and actions were held in Chiapas, Campeche, Oaxaca, Veracruz, Guerrero, Morelos, Puebla, Tlaxcala, San Luis Potosí, Querétaro, Chihuahua, and Mexico City. The principal demand of these protests was a change in energy policy that would include just prices, access to electricity as a human right, and the generation of sustainable energy from the people. Furthermore, there was demanded the cancellation of wind-energy, mining, and hydroelectrical projects, as well as end to the criminalization of social protest. It should be mentioned that during these protests in Chiapas, Nataniel Hernandez, director of the Digna Ochoa Center for Human Rights, was arrested while he was in a meeting with the regional sub-delegate for the government. He was released during the evening, without any sort of explanation regarding the grounds for his arrest.